Dental treatment is often last on the list of necessities for needy families. The dental health of these children and their parents is damaged by unavoidable neglect. For these families, there are simply too many pressures that must be addressed prior to dental hygiene. 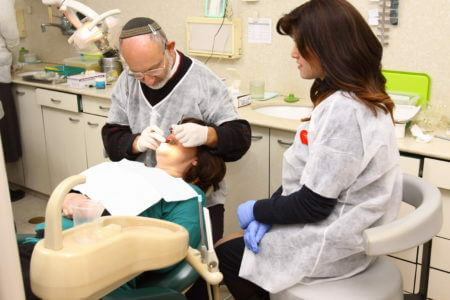 In response, Yad Ezrah established two dental clinics to alleviate the situation. The staff is composed of highly skilled professionals with a variety of specialists in various fields of dentistry, such as root canals and surgery. These services would be unavailable to this segment of the population without the help of Yad Ezrah. Currently about 20,000 patients are cared for in the clinics, and soon this amount will grow as we plan an expansion of services and a move to larger facilities. We will continue to provide quality care at significantly subsidized rates, contributing to the health care and quality of life of our needy brothers and sisters. For inspiration, watch the video below. Be a part of our SUCCESS ! "Yad Ezrah was there for me and my family when I had nothing. I hope to be there for them when I have something. Thank you, Yad Ezrah, for your love, concern and much needed chesed." " There were tears in my eyes when I saw the bride and groom smiling with nothing but happiness in their hearts. This was possible because Yad Ezrah made certain they would have a place to live and the home essentials needed to start a life together." "I was lost...had no place to call home...depression was my only friend. Yad Ezrah changed all that. They taught me how to interaxt with people and now I have a home and a place to work. I now see a future." "It is my wish, hope and prayer that Hashem will answer your personal prayers for all that is good, and He will awaken your heart to do acts of benevolence and charity. May you thereby merit to be a partner and a witness to our final redemption." There are organizations that feed people...organizations that clothe the poor...some provide health assistance...others give financial aid...some offer educational support...some offer Shabbos & Yom Tov meals...others help newlyweds...some offer Pesach assistance...etc.